In case you hadn’t noticed, winter has arrived. Yes, for most of the country, Winter means weather, but in California and specifically on the Monterey Peninsula, Winter is more about the holidays and wondering why scarves and gloves look cool, but are actually uncomfortable in 65 degree weather. Most importantly, however, winter and the holiday season mean family. Whether you are entertaining guests from out of town or spending time with your own, there are many options around the Monterey Bay, but none excite the group as much as the Monterey Bay Aquarium. Beyond the world-wide reputation and overall greatness, the Monterey Bay Aquarium is offering several recently new and exciting exhibits and that are sure to awaken the wonder in everyone. Tentacles, the Astounding Lives of Octopuses, Squid and Cuttlefishes debuted to much fanfare a few short months ago and has been enchanting guests ever since. 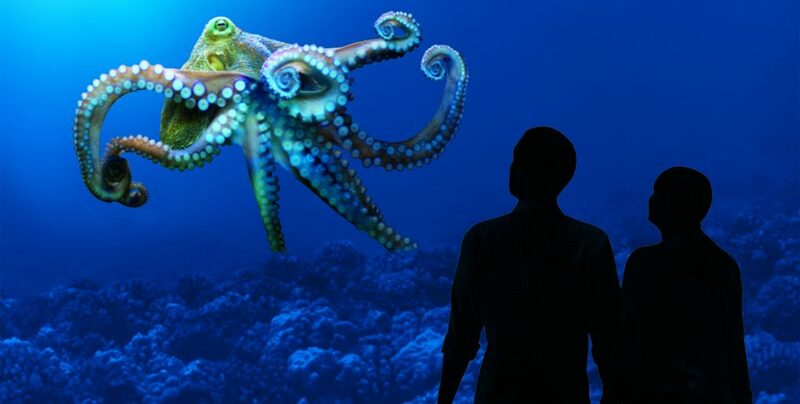 Featuring giant rooftop tentacles and multiple tanks filled with 9 types of cephalopods, the exhibit will immerse you into a whole new world of these ever-changing sea creatures. One of the other recent exhibits is the Jellies Experience. Gain a whole new appreciation of this beautiful mysterious and sometimes dangerous ocean dweller. Eight different types are featured and their graceful water-ballet amidst black-lit rooms is something to truly behold. Their simplicity and complexity are on display all at once in an almost surreal experience. The Aquarium’s favorites are of course on hand with Penguins, Sea Otters, the Kelp Forrest, the Splash Zone and daily feedings and classes available for everyone’s enjoyment. Most recently, viral videos of rescued sea otters have made the rounds on YouTube and Twitter, but now you can see these cuddly kits in person! If your guests are from out of town, the Portola Hotel & Spa offers a very special Monterey Bay Aquarium Family Getaway for $199 (now through January 31, 2015). Guests will receive accommodations in a nautically inspired guest room, a warm homemade chocolate chip cookie, 25% Off* on Food & Beverage for Dinner in Jacks Restaurant and two adult tickets to the Monterey Bay Aquarium which are good for two consecutive days. Book Now! This winter, if the parkas and scarves have not made it out of the closet, but you are looking for a great experience for the family, check out the Monterey Bay Aquarium. They’ll thank you for the best present of all, quality family time! Book now and stay December 1, 2014 to January 31, 2015. Terms and conditions apply. Based on availability. Not applicable to groups. Blackout dates apply. Celebrate All Season Long at the Portola!